Roses do not adorn any of the rooms. I’m sitting with my computer at an empty nurse’s station and have view of two empty rooms, beds made with hospital corners. Beyond the empty bed to my right I can see the Sleeping Giant out the window. It’s a great hulk of a mountain here in what is known as the Queen City of the Rockies — Helena, Montana. I made it here. Not an easy feat when one accepts the almost-monkhood of a writer’s life. Poverty and chastity, or something like that. I left behind a promising bloom of roses in my garden to face my friend Kate’s cancer situation. I’ve always been rebellious, like the rambling wild rose, so I’m here to lend a fighting spirit. Kate has always been steady and strong like a standard rose that comes back after a hard winter. Everyone who knows her speaks in wonder at how she is the one comforting and lifting the spirits of family and friends. She’s amazing. There is yet life and we will nourish that. I see her legacy in the darling teacup roses in her wake — she has nine grandchildren. The most delicate bloom budded just three weeks ago. As you can imagine, her daughter and husband are weary. A new baby (number five) and Mom hospitalized, unable to digest anything, a pump, IVs and tubes entangling her in a web Kate calls “Charlotte” (you know, as in Charlotte’s Web). On top of all this life transition, our sweetest new rose might have a life-threatening disorder. As I cradle this tiny bundle and stare into her cherub face, I find it hard to believe. It’s like looking at bud that has a dreaded blight, but for all the wonder in the world all you can see is breathtaking beauty. We hope. We wait. We pray. For breakfast this morning, we were treated to Steve’s Cafe in Helena. It’s Molly’s birthday and she’s being generous to everyone else. Another legacy from her Mom. Her children are so full of love — the reason I’ve cherished my friendship with Kate all these years. That woman is a fount of love. When the 10-year-old asks the two-year-old, what are cows made of, she gets distracted and rambles on about udders and milk. I haven’t have this entertaining of a breakfast in a long time. It’s strange being here, in Helena. When I arrived, yet afraid to go to the hospital, I paused at the Staggering Ox, an old college hang-out where Kate and I spent plenty of time “studying.” Back then, we both wanted nothing more in the world than for our children to be happy and for us to write the all-American novels. There I sat last evening, compiling flash fiction by an array of writers expressing creativity and skill, still wanting the same things. Helena has changed much in 20 years. Things are both familiar and not. I drive around in circles knowing the post office is nearby but forgetting where, exactly. It was a triumph to find it. Old memories surface as I drive to the hospital — the gym where Rock Climber used to take gymnastics when Molly was a high school star gymnast. The print shop where Kate and I worked to get our college’s literary magazine published, so proud to share the title of co-editors that senior year. The Cathedral where we all went to mass, the museum where I learned historical research, the government office where I interned as a writer. Also familiar yet foreign is changing a diaper. I remember how but fumble at it like a novice rose pruner. That was so long ago, yet so recognizable. Following the multiple conversations of eager children, delighting in their favorite stories. Sleeping in my friend’s bed with her cat purring by my head to show they’ve accepted me in the gap. At breakfast, two-year-old Marcella started to talk about her rose. Every night, Molly, her husband and the children share their roses for the day. We all have thorns, but they focus on the beauty each experienced that day. Marcella is starting early, telling her Mama that her baby sister is her rose today. Eight-year-old Carly smiles across the table at me and says, “Aunt Charli being with us in my rose.” I’ve never felt so precious as I did in that moment. What is life, if not craving the rose? Respond by June 9, 2015 to be included in the weekly compilation. Rules are here. All writers are welcome! Ramona hummed and watered, “I beg your pardon…I never promised you a rose garden…along with the sunshine…you need a little hose-water sometime.” Vic loved his roses, tending each stalk with care. Ramona tended chickens, the kitchen garden, horses and calves. Twins? She tended twins, didn’t she? Ramona frowned. She looked across the spray of water, beyond the tall standards that would soon unfold creamy yellow. Wild roses bloomed in profusion where she found the yin-yang rock. Vic transplanted them from the canyon where they used to ride horses and picnic from with cheese and crackers. Sad roses. But why? 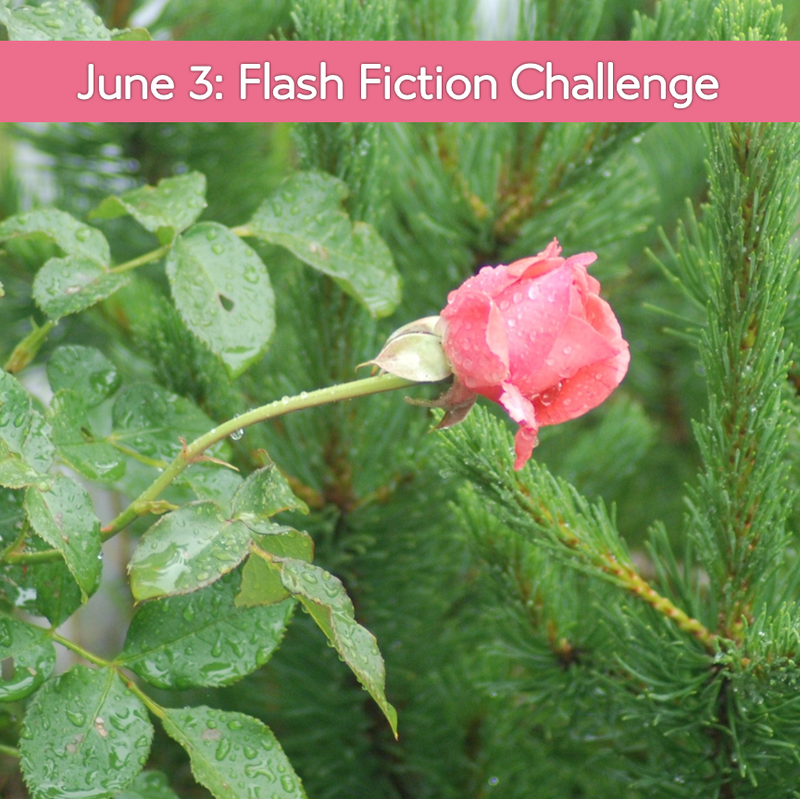 By Charli Mills in Flash Fiction Challenge on June 3, 2015 . You flash is appropriately enigmatic, Charli – sharp snarling stems and thick life resistant leaves ending in such an explosion of sumptuous scent and scenic splendours Roses are indeed the yin and yang of flora. A lovely life affirming prompt too, finding the uninhibited joys of early budding lives trellised amidst the time-fading blooms of another’s life well lived. And how beautiful that your friend comforts and relaxes you all with her jokey naming of parts, while you all are admonishing her, however quietly not to Go Gentle into The Good Night. My flash will follow but I had to let you know I and I’m sure all your buckaroos and Rough Writers are rooting alongside you. Thanks, Geoff. I have come to the realization that it is a privilege to be at the trellis when the pruning hand arrives, taking our favorite, now bloom. The oncology nurses have all said they’ve been waiting to meet me. Kate knew I’d come. Her daughter said she’s actually turned down visitors because she feels so ill, but she’s welcomed me into her room all day and even has me set up on a lovely desk in the corner. We laugh and joke, set tears aside and plan her funeral. I’m asking her advice on my writing and will get her to write flash with us this week. Fulfilling to be in her garden at twilight. I’ll be a wreck after she goes. I’m not sure if it was luck or what but when dad died, te night before he squeezed my hand, pretty much his last action; and mum’s last conscious moment was to say ‘hello darling’ and smile her denture free grin. Hold on to one beautiful memory, Charli then the wreck won’t seem quite as bad or as close. Thank you for sharing those moments. My friend has her teeth but is missing her hair. She actually has a beautiful head and her eyes are so…her! There’s a undefinable quality about being with a loved one at this time. I’ve gotten teary-eyed a few times but I also feel that all is right in the world. Kind of like when you have a newborn — the world simplifies; you focus on the needs of this new creation. With death, the same singular focus returns. Is that odd? I don’t think it’s odd, Charli. It’s timing, purpose and acceptance. Charli my heart goes out to you, Kate and her lovely family. This must be one of the hardest things you’ve had to do. I can’t imagine anything more beautiful and uplifting despite such emotional stress and difficulties than the way you’ve spoken/written about the “rose.” What a cherished sentiment – and I can only marvel at the shared loved and generosity and compassion that is being openly offered to you and your dear friend and her family – by her family and herself, and clearly you as well. A full circle of love in life – even as the “thorny” moments are clearly visible or at hand. As for the prompt challenge – indeed – another interesting one. As for your prompt response – very apt and fitting – although I haven’t been following your “serial” for that long – it is interesting, a bit heart-breaking, certainly evocative, and definitely filled with life – including the rose moments and the quick – pull your hand away “ouch – thorn bit me” moments. What a beautiful thing to write. Thank you. It is a flow of life moment and I’m convinced that the importance of who we accept into our lives matters most at times like this. I wish your friend peace, charlie. Glad that she is surrounded by family and you could travel the distance to be there as well. You’re an early bird this week, Ruchira! 😀 Thank you. We are all surrounding one another here and there is a mantle of peace upon us. A moving post and flash, Charli. There’s a strange intensity in being part of a community around people who are dying, but do watch out for those thorns. We actually got rid of a lot of the roses in our garden when we first moved here because they can be a hassle to maintain, but those that remain are cherished. Saw the first bud opening just this week, so very timely for me. If I can’t find a book to review to fit this prompt, I might just post a few lines about roses from my novel if I can tease it into the word count. I hope you can enjoy these last days with your friend. I’ve seen thick gloves that go up to one’s elbows for rose wrangling. I’ve been pricked plenty but proud of getting the climbers to climb something. I’d enjoy a 99-word rose scene from your novel if a review doesn’t match up. Thank you. I am enjoying these days. I hang out in the morning with her grandchildren so I can report to her the silly things they said (the two-year old squealed with delight that I could whistle despite the fact she whistles better than I can). She can nerd out with me over Tolkien (she’s an expert!) and literature and even has advice for my writing. We chat like we’re on vacation and joke with the nurses. We plan her funeral. It’s meaningful time and I think everyone should be so blessed to be welcome intimately to sit at a loved one’s deathbed. Hope things are still okay over there. With pics of my not so wonderful roses. Thorny today, but things are how they are going to be. We had a blessedly wonderful day Friday, so I cling to that! I can’t wait to go read, so I can look at your roses. I’m rather sporadic at the moment, but I will get there. Charli, I can feel the love entwined in your words, the love for your friend and hers for her family. The use of roses to portray that love and positive outlook is very effective and emotive. That the friendship and love between Kate’s and your families was able to bloom so is a tribute to the nurturing environment you shared as young people and continue to do so. I really appreciate your reference to Kate’s grandchildren as teacup roses – gorgeous. It just makes me want to cup them in my hands and cuddle them. I also love the use of a rose to signify a positive thought about the day. What a great idea, and so special for it to be passed from one generation to another. That you were one girl’s rose is not surprising. I’m sure you have many times been someone’s rose, and many of those times you would not know it. Your flash portrays Ramona’s loss (of memory and her twins) so very well, with feeling and compassion. We not only grieve for her loss, but for our potential future loss. On Mother’s Day morning Jean’s father always went out back before church to clip five red roses, one for each of the three kids and for the two parents. This morning, though, when Daddy pinned the roses on, he put a white one in his lapel. At dinner, Grandpa escorted a new woman. She called herself Blanche. Thank you, Paula. That’s such a difficult time, the “firsts” after the last. Yes, indeed, Charli — especially when the “first after the last” reveals some cognitive slippage. Well done, Paula. That is indeed a difficult time, and poor timing. Something none of us look forward to. Thanks, Norah. Like they say, you can’t make this stuff up. The names are changed, but it’s all true. Forgiveness for the Grandpa comes in knowing that by calling Blanche “Neet,” he gave away that he wasn’t calling he shots. I’m going to have to try that sausage game with my 4- and 6-year-old when we have our car trip this summer. It sounds like a fun way to build language skills as the miles pass. I am so sorry to hear about Kate. How devastating to watch a life taken too soon. And my prayers for the granddaughter, that this be something she can recover from. It will have you all laughing, Sarah! Thank you, Sarah. It’s a waiting time and we are making the most of it. What a gift– focused time! I’ll get over to your flash soon. Writing in spurts at the moment. Friends take precedence, especially at a time like this! I’m so glad you can appreciate this waiting time. My flash will stay in its corner of the internet long after this week. What a post, Charli. New life, death, family, loss. The roses… A beautiful tradition. This post is so…full. Of everything. All our experiences. And you are taking them in all at once. Amazing overwhelm. I am so sad and so happy for you, I can’t express my thoughts right now. Know I am thinking of you, up there in Montana, giggling and crying, holding hands and typing. That really sums it up. I never thought sitting could be so exhausting and yet the time flies by and we have so much to talk about! We’ve been giggling and rowdy today! AND…I got her to write a flash though she grumbled loudly over the word constraint! Love this image of you two. Your words are beautiful Charli and my thoughts go out to you at this time. Having a new born really does bring home life and death in a very special healing way and I hope the little one can be treated for the possible condition that she has. What a lovely positive way to end a day to talk about a rose that you have had. Those children are going to grow up finding the positives in life which will stand them in really good stead. Kate is leaving a wonderful legacy of love behind her. What a spooky photo to go with your flash! Merry-go-round horse? I actually wrote this before I read the post, and if I had I wouldn’t have written something so somber. So I apologise. The soft petals barely out of bud kissed my cheek as I tried to inhale the sweet pollen, but it wasn’t strong enough, not mature enough to smell yet. I laid the bunch of almost roses on the coffin and stepped back. If they had time to mature, they would have been white, innocent like her. But they would never get to blossom and neither would she. Thorny tears sliced into my cheeks; reminding me her pain was gone now. One of Kate’s favorite things to say, there’s always hope. And no apologies. Write where the prompt leads. Sacha, I read the flash first before I read your introductory lines, and saw, not a child, but an innocent white kitten being interred. Perhaps it was the “forever home” phrase, which I associate with adopting pets. Very moving! Such beautiful rose imagery that caries your flash. The “almost” buds captures the parental devastation. “Thorny tears.” Somber, yet well-written. Powerfully sad, Sacha. A tragedy. I feel for the loss. Sacha, let me know if you want to add a link. I’m working on this earlier than typical and more addled than normal. Nope. Not been publishing any writing challenges – trying to get my novel finished. Once the first draft is done I’ll start publishing the writing challenges again – it’s just one less post to do each week – every little second counts at the min! Rose turned for the fridge to get the last beer. Ethan tuned his guitar. She would listen, She’d always listened. But then she’d leave. She would finally walk out the tinny walls of the trailer in lot 6C for good. She’d spent her twenties waiting. On tables and love. Ethan sang his song. Tears bloomed in her eyes. When he was done he smiled. She nodded. Ethan’s gaze fell to the bag at the door. Rose stepped closer for a final kiss goodbye. My favorite line: “She’d spent her twenties waiting. On tables and love.” It’s the long, final goodbye. Or maybe it isn’t! You never know with these country songs! Thanks Charli! That’s true! In country songs, the rambling rose often returns to the trailer court roost. Ha, ha! Okay…I see Pat and Sarah flagged that line, too. ‘What is life if not craving the rose?’ So much meaning in these few words. Roses have played a huge part in my life, determined as I was to grow them when I first moved to CA over 30 years ago, and have done ever since. Their blooms and brambles have climbed their way through storm and sunshine, aphids and mildew, drought and floods, yet still they grow, in every garden I’ve ever lived. And now, reading here your beautiful analogies between your roses and Kate’s ‘teacup roses’. And then Ramona’s sad roses. Why indeed? The mystery grows. Yet even in the midst we read of the Sausage game and I smile and laugh with you as I remember those silly days and of silly fun and of all that really matters in this dark world of ours. At such moment, a glorious light shines in the hearts of all you write about, even when things look at their most dire, as you gather together, surrounded by love and comfort in one another. I’ve not had the touch with roses. Every year I planted a bush and every year it died. I’m a careless creative, a barefoot gardener throwing seeds in the dirt or words on the page and I go with what grows. The roses just never grew that way. So when I arrived at Elmira Pond and discovered a rose garden, I was terrified. Little by little my confidence is growing with them. This is the first year they have come on so strong so I must have tinkered correctly (and thank you for adding to my rose inquiry; you, Geoff and Jeanne will have me up to snuff). Thank you for your beautiful comment, too. We are surrounded by the good things no matter what shows up. Good luck with your laptop! Oh Charli, I only just read your reply through my notification button. When I first moved to CA, I had no idea how to grow roses either. Somehow it all came together as with you and your blooming beautiful rose garden, but having said that, everything I’ve learnt about gardening is through trial and error – and a lot of advice from my mum 🙂 Now she is the expert. I should add her to our gardening club! Marvelous imagery, the red petals and the single white! The character’s strength and dignity comes through s strong with the collection of dried and crumpled roses. Hospital rooms are remarkably comfortable places to write. I hope that wasn’t the case with your flash. The scene in my mind after reading is so vivid. Yet Ed and Edna have their own voices, and though they may prickle at each other, the love shines through! Larry, I think I appreciate Ed and Edna all the more for their solid sense of values and humanity. Real life is in these Ed and Edna moments. What a privilege that you share them here. Once again, an outstanding prompt! My flash is Black Rose and Red ( https://goo.gl/C2uZCe ). Thanks, Pat. I think Kate’s gong to assist with the next one if she’s feeling the bloom in her thorny situation. And what a beautiful desert rose. Selenium? The laughter. The tears. The journey. Charli, may you find comfort in the time you have been able to spend with your precious friend. “Yellow roses.” Her Mother had told him. A yellow rose, any yellow rose. A poignant reminder of her first love. She had been trying to grow them for decades. Thorns and leaves were the result of her nurturing. That Yankee drawl she knew to be his, had been the reply when she answered the telephone. He sat on the deck smiling, watching her tend the beautiful yellow blooms. How did the roses know that they had found each other? Thank you, Ann. It is comforting for us both, this daily gift of time and presence. What a sweet romantic story in which the yellow roses participated! Listen…can you hear the bird? It’s sitting in the tree, chirping happily. The wind is gusting. It plays with the palm fronds providing background music for the bird. Then the pigeon joins in, giving a coo coo back beat. Despite the cold morning the sun is now warm on my skin. I sit and relax, my senses taking in all that is around me. I am like a lizard, lying on a rock, soaking up the warmth. It is winter here. My roses are bare. Come spring they will bloom again. Until then this tranquility is my rose. Love that — a “a coo coo back beat.” That’s a reflection of tranquility! I agree. That is a great line. You have used so many of the senses in this piece and is is just lovely listening to the music of morning, feeling the warmth from the sun that is being basked in, seeing the bare rose branches and feeling happy. Lovely Ruth. We think gardeners are insightful, yet this story shows that the roses are, too! Your garden is beautiful. Thanks for the tour! Loved looking at the roses! You had gentle hearts to guide your hands and direct your feet. I will give petals to Kate as she slumbers, peacefully, I hope. Thank you, Geoff. She held her little granddaughter this morning on her chest and said it felt so good! Step-by-step, minutes quickly transformed into hours and dusk blackened. Erin and I talked about nothing and everything with each sentence shared; they all seemed meaningful. The unsightly litter, graffiti, and random mismatched decorating abilities, for some reason, never detracted from all the beauty that surrounded these strolls. Screaming neighbors: a corner a cappella. Barking dogs: harmonious percussions. Uninviting: That damn sign that read, “Pick your noses, not the roses.” Ugh. Loved the twist at the end and the humour that went with it. Last night I got to rock my friend’s three-week old grand-baby as her parents went for a stroll. “Date night,” they called it. 🙂 I like how this story makes music of the neighborhood sounds. Humorous twist! A beautiful post. Thank you for sharing. Welcome to Carrot Ranch, Melissa! And thank you for your kind words. I’m happy to have you join us at the ranch! Your flash gets to that emotional core of grief. Kids…those kids. Grabbed roses and twirled them like banners. “Brats,” she murmurs indigently, knowing she’s unreasonable, but it’s her Les, his reverence. Lorraine chuckles. He would lead the parade. Petals tickle her cheek. Lorraine’s face embraces the rose. Les’s eyes, twinkle in Kevin’s face. “I removed all the thorns so they really are peaceful peace roses. Charli, your path is clearly through your writing, the deep emotions parlayed through words moves me more than I could express. Thanks, Phil. It’s how I navigate; not by stars but by words. Though I prefer the starry days! The sweet fragrance of roses drew him in at first meeting. From that moment he knew that his years of wandering had come to an abrupt end. They made a toast to the festivities as the evening progressed not really making any promises beyond another work day together at the Fair. The essence of that meeting became the focal point of the next year. A bouquet of dreams wrapped in promises led them to unexpected adventures across the country and back again with no regrets. Nearly 20 years have passed and she still is the rose of his life. I always get a bit choked up when love remains strong after so many years. Beautiful flash. What a beautiful continuation of Ramona with her fuzzy memories. Loved the yin and yang rock having a profusion of roses. Sad memories that she can’t quite grasp. I’ve often wondered if this character appeared in my imagination to help me navigate loss, yet it is rather uncanny that one of the challenges my friend is facing is that of a “mushy brain.” When she’s cognizant, it’s wonderful, when not it’s painful. But time is a gift. Being in the moment with another person is something we forget as important. Thank you. It is uncanny and who knows how the mind works and why. That being in the moment is indeed important. It’s sharply focused on here and now. Thanks, Rebecca! Hope you and your family is well. I’m getting lots of baby time with a wee one born May 12, so close to your precious bundle! Thank you to all you lovely writers! Your stories have been a balm this week. If I’m early (which could surprise those of you who know that I am often not), please submit your story yet. I will update it into the compilation, but it might not be until Friday or Saturday. There will be a prompt tomorrow because Kate gave me one before she developed a fever that has robbed up of her clarity, smiles and conversation. I’m praying she gets better. If it were me, she’d say, “I’m praying my socks off!” This is part of the cycle with chemo when her white blood cells plummet. She pulls out of it until the next one. Her cancer is terminal and we are soaking up every moment, good or not. She is my rose! Her daughters and grandchildren are my teacup roses, each one as colorful and unique as a garden.